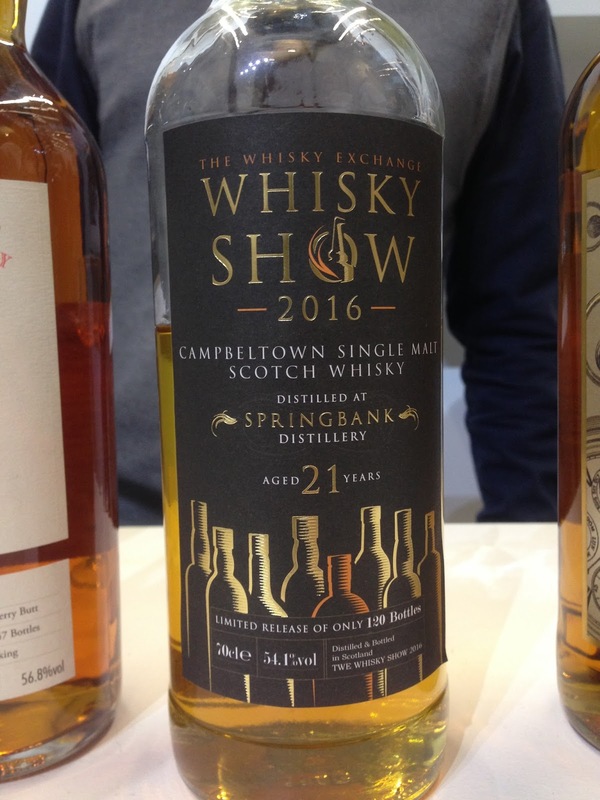 Today I’ve got more from the 2016 Whisky Exchange Show in London. This time Springbank! I’ve decided to clump some of these reviews together otherwise I’ll never get through them, so these were not tasted together or compared. First up is a single cask bottling specifically for the show, the show bottling if you will. Or if you don’t will, it’s just what it is. Anyway, story goes that a guy bought a cask of Springbank, I spose in about 1995, and keeps it. He then realises 21 years later that he can never drink a whole barrel of whisky to himself so sells some of it to The Whisky Exchange. 120 bottles worth in fact. Nose: Sweet and juicy, very fresh, toasty oak, lovely fresh fruit, red apple. Incredible balance. Taste: Full, red apple, very sweet and fresh, balance and integrated. Fruity, mouth coating and creamy. Finish: Long length. Tropical and some oak. Nose: OK, I don’t remember much from my 20 second encounter with this, but I do remember it being super complex with lovely fruit and spice combo, lots of complex spices and oak. Taste: More of the same, complex spices, complex oak, lovely oily fruit. Finish: Long length. Chocolate + mmmmmmmmmmmmmmm. Lovely old Springbank, not sure if this is Port finished as the others normally are? Again, this will probably be very expensive. Looking at the previous 25’s, I’d guess in the £450 range. This last one is another pre-release sample, this time from Hazelburn, the triple distilled, non-peated Springbank. This has been matured in Bourbon barrels for 6 years and then finshed in Barolo wine barrels for 3 years. Barolo is one of the kings of Italian wine for those that don’t know, it is noramlly aged for at least a few years because it is very tannic young. Nose: Full on, floral, violet, wine tannins and bitterness. Taste: Full, oaky and powerful. Wine tannins, fruit then coming in. Finish: Short/Medium length. Vanilla, fruity. A little unbalanced for me, the heavier spirit of Springbank or Longrow would have stood up better to the long wine finish in my opinion. This couldn’t really compete with the older Springbanks but it’ll be a lot cheaper!